Here's your DREAM-COME-TRUE place, with deeded private Lake Michigan Beach assess area, this 1927 church has been turned into a super rare living area, with beautiful lofted ceilings, 2 nice size bedrooms (the 3rd is smaller). The majestic feeling hits you even before entering! It has retained its original bell tower with working bell, gorgeous stained/leaded glass windows, beautiful hardwood flooring, giant open concept and much more!! The property also consists of a super nice 2 story fully insulated barn which would make a great guest house, especially on the second floor! The yard is huge & beautiful. Situated on a corner lot, & only 3 blocks to Lake Michigan, this property is perfect for either a large summer retreat or a great year-around residence with massive possibilities!! 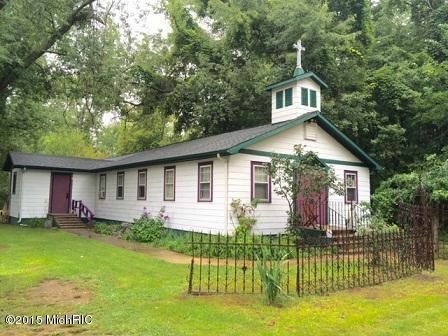 Advertising Remarks Here's your DREAM-COME-TRUE place, with deeded private Lake Michigan Beach assess area, this 1927 church has been turned into a super rare living area, with beautiful lofted ceilings, 2 nice size bedrooms (the 3rd is smaller). The majestic feeling hits you even before entering! It has retained its original bell tower with working bell, gorgeous stained/leaded glass windows, beautiful hardwood flooring, giant open concept and much more!! The property also consists of a super nice 2 story fully insulated barn which would make a great guest house, especially on the second floor! The yard is huge & beautiful. Situated on a corner lot, & only 3 blocks to Lake Michigan, this property is perfect for either a large summer retreat or a great year-around residence with massive possibilities! !